It only takes your batteries failing one time to get stranded out on the water. With the innovative CHARGE Power Management Station on-board, you can leave the dock with the peace of mind knowing you’ll be back. 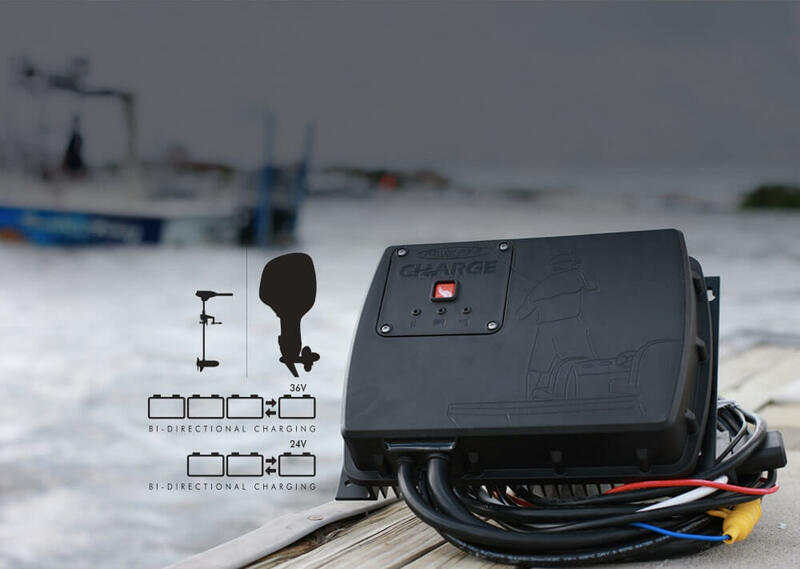 CHARGE is the world’s first bi-directional marine battery charging and power management station which means it doesn’t just put power into your battery, it moves power around from cranking battery to auxiliary batteries to keep them all balanced and charged. With Power-Pole CHARGE you can run your trolling motor and your accessories without worrying about your battery levels. It’s our newest way to POWER YOU. 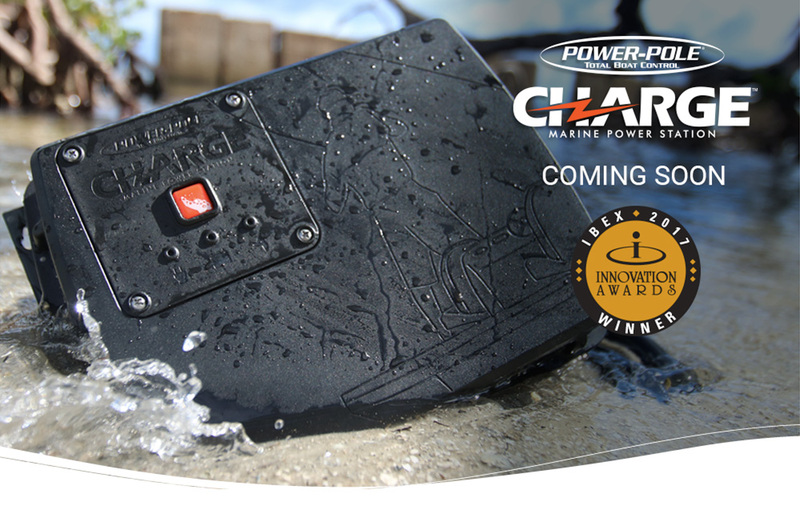 The Power-Pole CHARGE is the world’s first AC/DC and bi-directional DC/DC, all-in-one marine battery manager and charger. It’s designed specifically for boats that have up to three trolling motor batteries and one 12V main cranking battery. This 500 watt power station delivers up to 40 amps of charging power to the cranking battery and 25 amps to the auxiliary batteries. CHARGE works with multiple battery types; Lead Acid, AGM, GEL, and Lithium. CHARGE is water resistant, has built-in safety features and emergency start. Best of all, CHARGE gives you real time battery status and power movement on your smart phone or tablet using the C-Monster App. CHARGE is much more than just a battery charger; CHARGE is the first bi-directional power management system that has the ability to move power back and forth from battery to battery. The CHARGE power management station receives power from a 120V shore power outlet or the boat’s alternator. When plugged into shore power it will charge up to three auxiliary batteries and balance them while automatically charging the main cranking battery. When the motor is running, CHARGE will automatically fill the cranking battery, then charge and balance the auxiliary batteries. When necessary it moves power to the cranking battery from auxiliary batteries to maintain preset minimum engine battery levels so you can always start your motor. CHARGE seamlessly manages your power so you can enjoy more time on the water. CHARGE manages your power but you’re still in complete control. With Charge you can use the C-Monster App to easily control settings, configuration, and battery types. Charge allows you to set the minimum battery levels so you can still crank your motor after a long day on the water. For the ultimate in control, CHARGE serves up real time visualization of battery levels and power flow on your smart phone so you can make better decisions on the water. CHARGE also connects to the new Power-Pole VISION tablet for even more control and more options. CHARGE gives a whole new meaning to POWER YOU. Power-Pole has taken advanced technology inside your boat to deliver a battery charger and power management system that outperforms anything else in its class. CHARGE does the work of a traditional battery charger, plus an emergency start system all in one compact unit. CHARGE monitors your power use and puts power where you need it - no other battery charger system can do all that. Want to stay up-to-date on the progress of our new products? Sign-up for this special email list and we’ll send you updates on the status of all Power-Pole new products.